Really looking to explore with long exposure photography. 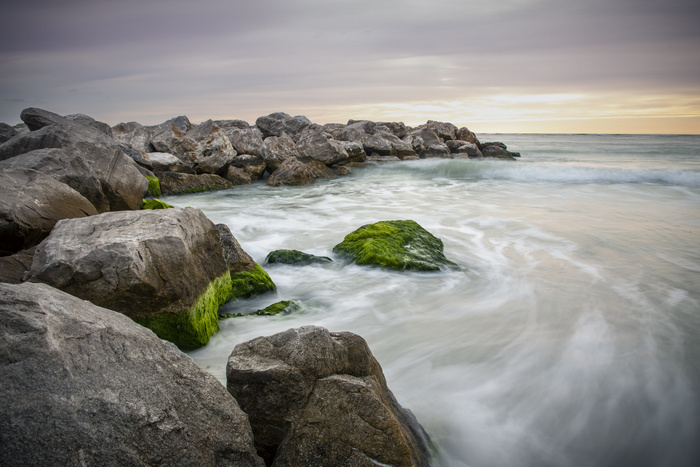 Here are a couple of shots from St. Pete Beach, Florida. Would love to get some CCs, any feedback? Definitely prefer the first, William, as the composition is more interesting & dynamic. I'd perhaps have tilted the camera down a bit more* to raise the horizon, as there is just a slight sense of nothing happening higher in the frame. 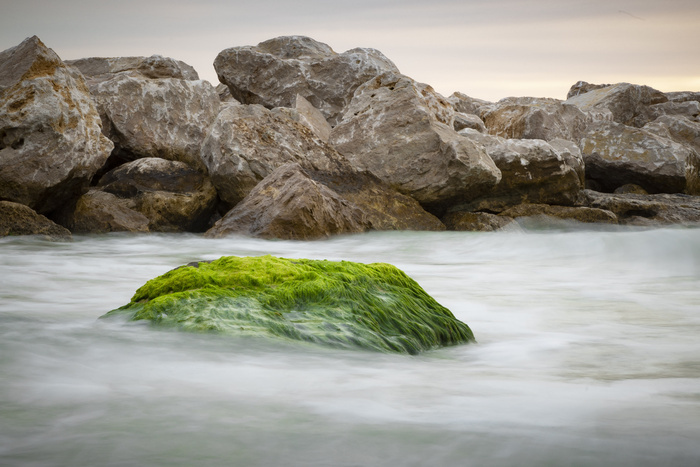 There IS actually plenty of interest in the top third for a subtle, understated shot, but that beautifully vivid green seaweed obviously dominates the shot, making the image as a whole bold, rather than understated. The greens are nicely, and subtly echoed in the breaking wave. *I've simulated this by cropping the top, as well as levelling the horizon, adjusting tones a little, sharpening a bit and reducing some chromatic aberration in the attached edit. Having said & done all that, I'm not sure mine's an improvement! The second shot would work better for me if there was more separation (i.e. water visible) between the green rock and the rocks above by raising the camera and pointing down a little, and if the green rock was more off-centre. I'd try left and right. I'd be very pleased with this as a first effort! I assume you've used no filter, but selected a low ISO and your smallest aperture. You could have tried ISO 50 with your camera, I think, and had smoother water for a different "look" as well. A 3-stop ND filter would have been handy to lengthen exposure further if you wanted. You can add stronger ones if you really want to play around. Thanks for the helpful feedback! That provides me with a lot of insight for future shoots. Much appreciated! I'm actually researching some ND filters this weekend and hoping to make a decision on a pack to purchase. Check out ICE ND Filters. I've been using them for a few years now. They are much cheaper than most any other company and they work great and have great quality. I like the top one as well. I would try some selective dodging and burning to bring out the patterns in the water. It will also enhance your leading lines and draw the eye to the green lip of the curling wave. For a first long exposure there is a ton to like in this image. Hi William, and welcome to the world of log exposure. I think in both images you have done a great job of capturing the flow of the water - I'm not sure if you did so on these images (as they look great the way they are) but I'd definitely take time to consider the flow ahead of time, identify areas of interest and then take shots with varying shutter speeds to get the image you want. There have been so many times where I thought I had chosen a great exposure only to find in post that there is another I prefer due to detail in motion etc. My immediate reaction to both images is that the green of the seaweed is overpowering and looks unnatural/radioactive in places. If you could tone this down (especially on the rock edges in the first image) I think that would improve the image. I too prefer the first image - it has a lot more going on with the swirls of the receding waves and I think the sky adds good balance. If buying ND filters be sure o check out reviews first. There are a lot of good filters out there but some introduce a significant color cast to the image. The stronger ND filters also require a different technique (ie set focus/manual before adding a filter) as quite often not only can you no longer see the image through the viewfinder autofocus will have a hard time and may not work at all due to the extreme lack of light/contrast. All in all really nice attempts, I can't wait to see what you present once you purchase a filter. Curious about your reaction to the vivid green, Alan! I really dislike over-saturated colours, but didn't think that about the greens in these images, as I've seen plenty of equally vivid-looking seaweed here in Southern Australia. To me, the images struck me as almost being a homage to the beautiful weed. I guess only William knows if it really looked like that, or if he used much artistic licence. Interesting!. That certainly is interesting Chris, I’ve certainly never seen seaweed like this before, but then again I’ve not been close to a Koala either, and I know they are real. Haha, actually the seaweed is the reason I chose that spot. 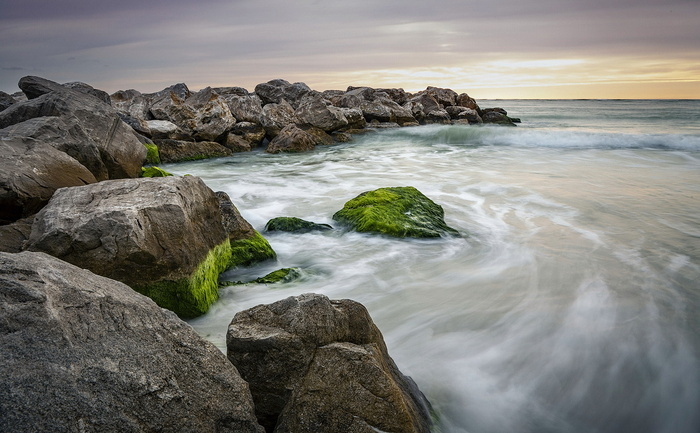 The tide pulling away and rushing in, covering and revealing the green was pretty hypnotic. The only color altering I did to the green was toning town the yellow a little.